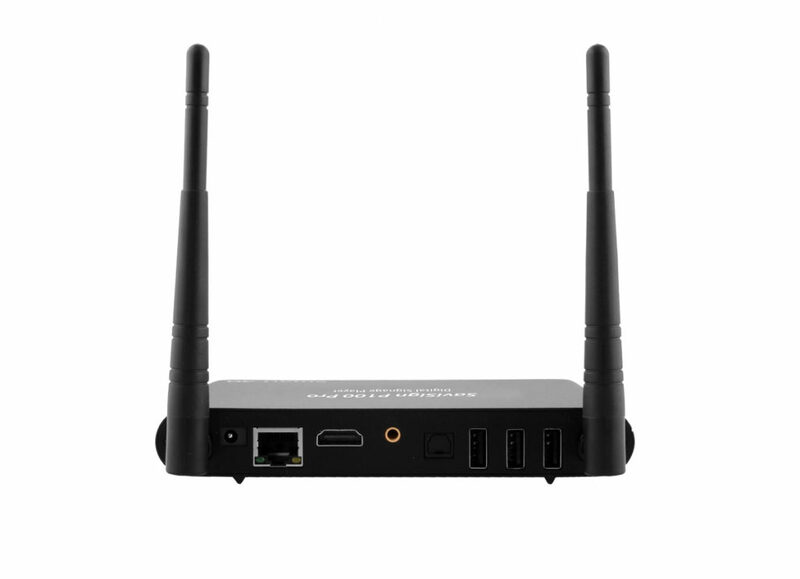 4K Wi-Fi enabled digital signage player with SaviSign Manager software; create, schedule, distribute, and update effectively with ease! 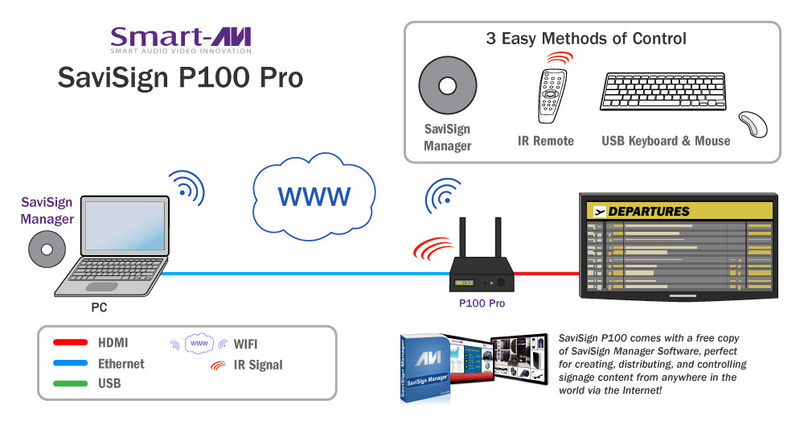 What is the SaviSign P100 Pro? 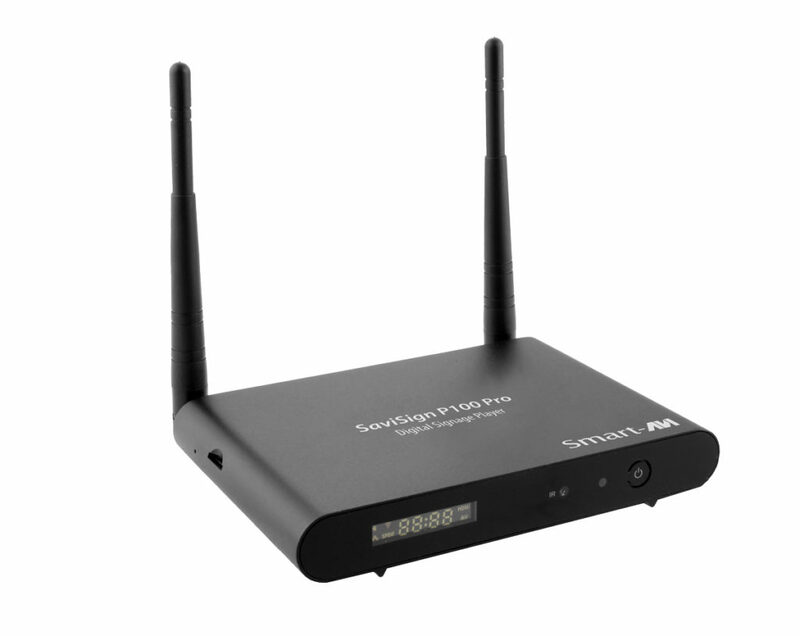 The SaviSign P100 Pro is a digital signage player with the ability to access and play 4K UHD resolution signage from anywhere in the world using the Internet. The player is WIFI-enabled to receive and display signage without physical connections to network routers or a PC. 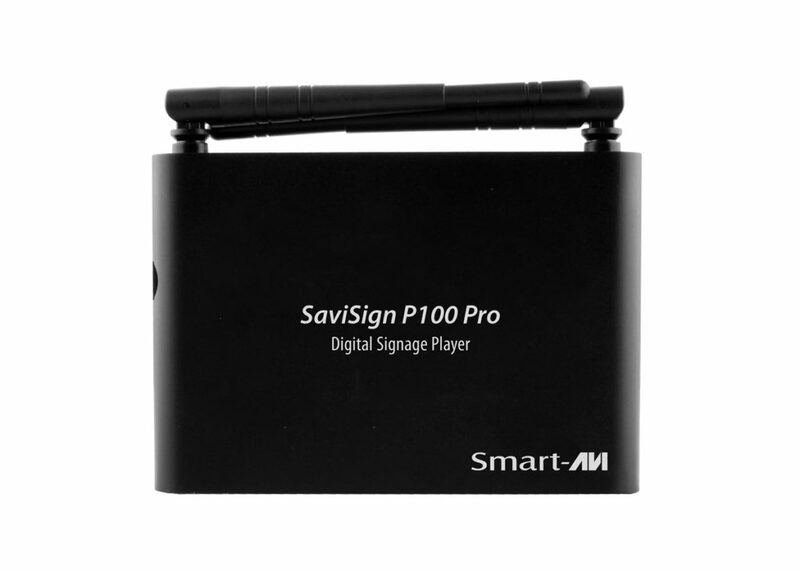 Better yet, the SaviSign P100 Pro comes with SaviSign Manager, SmartAVI's user-friendly digital signage management software for creating, scheduling, distributing, and updating signage on the fly! 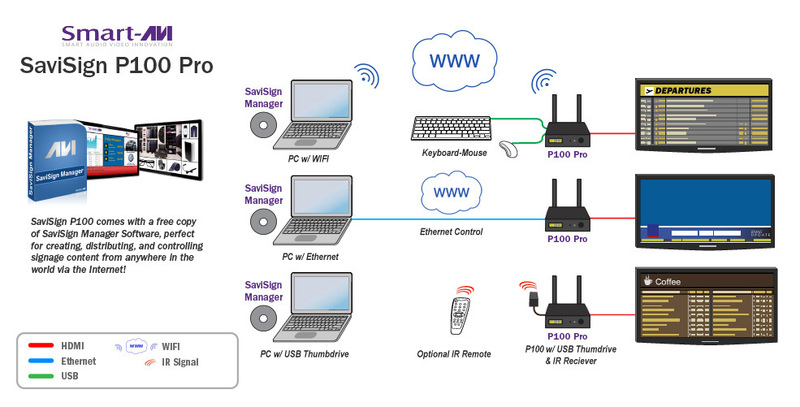 How do I control the SaviSign P100 Pro? SaviSign Manager: INCLUDED FREE! Easy signage management software with hardware control capabilities. Infrared Remote Control: INCLUDED FREE! Control your P100 Pro player from up to 20 feet away. USB Keyboards & Mice: Easily navigate and command your P100 Pro player with a user-friendly workstation interface. 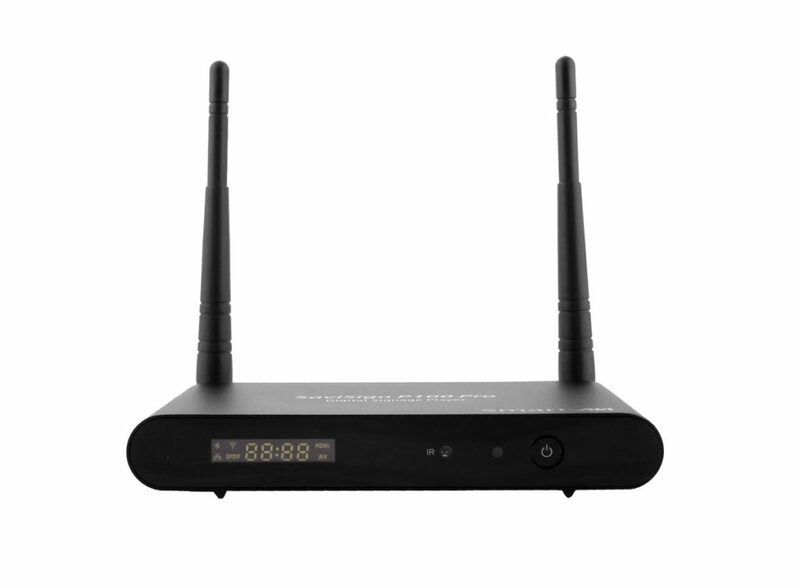 The P100 Pro is plug-and-play, meaning it is ready for use immediately once connected to a display and power supply. Access your signage via WIFI-enabled streams from SaviSign Manager software, USB storage devices, or even the P100 Pro's onboard storage system. The SaviSign P100 Pro is the perfect solution for improving the visibility of your business or essential information in any environment with eye-catching 4K digital signage displays. SaviSign signage works well when paired with HDTVs, LED displays, LCD displays, tablets, digital billboards, and more. Retail Increase traffic in your store or mall by showcasing merchandise in stunning high definition. Transportation Display key travel information in airports, train and metro stations. Corporate Seal the deal with eye-catching presentations in corporate lobbies. Education Connect with the student body by sharing upcoming events and activities in schools, colleges, and universities. Restaurants Inspire your customers’ imagination and appetite with mouth-watering digital menu boards. Hospitality & Entertainment Add a digital concierge to your hotel with weather, news, and activity information, and provide entertaining messaging at your casino. Supermarkets Share products and special offers with customers as they shop. Weather Engage viewers with eye-catching graphics while providing the weather forecast to your visitors. Stock Market Display stock market highs, lows, and percentage data across multiple screens in real time over the internet. P100-RS (Optional) USB to RS232 db9 female cable.